The GA variable speed driven compressors perfectly follow the application’s air consumption avoiding the very inefficient transition period from full to no load and eliminating excessive off load power consumption. With VSD technology, Atlas Copco has made major energy cost savings a reality. The GA+ Workplace Air System™ provides industry leading performance and answers to all your advanced compressor control requirements. With its extremely low noise levels you can install the compressor anyplace that is most suitable and cost efficient.The GA is by far the most reliable tank-mounted workshop solution, immediately ready to supply high quality air. Integrated air treatment – All GA compressors have integrated dryer, filters and oil-water separator available to protect your compressed air network. 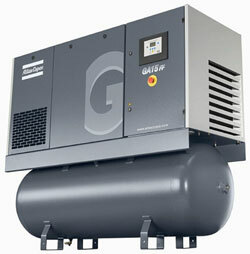 This quality air expands the life of equipment, increasing efficiency and ensuring quality in your final product.